A picture is often worth 1,000 words, as goes the well-known adage. This is certainly true when it comes to architectural illustration. Having a beautiful and marketable visual rendering of a proposed project makes it much easier for investors and other interested people to understand what a project will look like when completed. Providing an image that people can understand and appreciate can make a significant difference when it is time to present the project to possible investors, building authorities or members of the public who may be asked to support a project. Architectural illustration can be used to demonstrate both exterior and interior designs. These realistic and detailed renderings can bring a project to life and create excitement. Ideas, concepts and sketches can be transformed into lifelike images that capture the essence of a project in ways that are easy to understand and appreciate. I recently worked on the proposed Marriott hotel project on the Manchester Quarry site. The architect and interior designer of the project is Gray Design Group. Half of the hotel will be a Courtyard by Marriott while the other half will be a Residence Inn Marriott. With the drawings from the talented team at Gray Design Group, I helped bring their vision to life with a colorful architectural rendering. 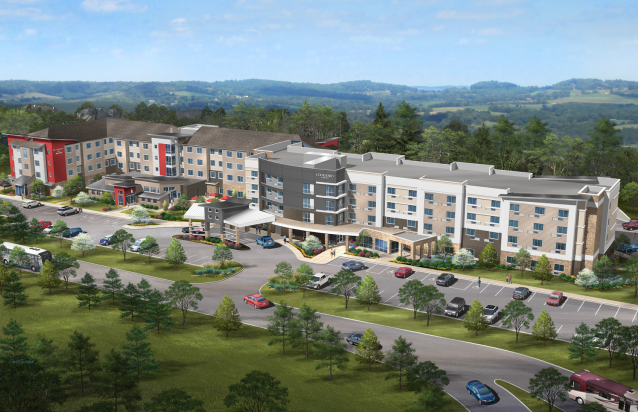 The architectural rendering that I created for this project is a digital, full-color, low aerial rendering, which provides a concept illustration of how the completed structure and landscaping will look when finished. Contact David Ruiz Art to learn more about how architectural illustration can help bring your project to life, too. Call me today at 636-928-4230 or send an email to davidruizart@gmail.com.